to reflect the exceptional proportions, polish, and symmetry of a finely cut round or princess stone, by expanding upon the elements of a classic diamond analysis. The most preferred stones are graded on a scale from very good to ideal plus, and are notable for their outstanding interaction with light. Cut Grade Diamond Reports are offered in a variety of styles. 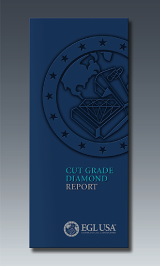 A full-size Cut Grade Diamond Report issued for a loose stone includes an exclusive EGL USA bonus: a free appraisal summary from the lab’s affiliate, Universal Gemological Services (UGS).